Alex initially trained as a human physiotherapist and continues to work within the NHS in Orthopaedics and Musculoskeletal Physiotherapy. 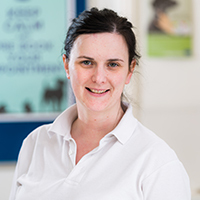 She completed a post graduate diploma in Veterinary Physiotherapy at Hartpury College registering as a category A ACPAT member (Association of Chartered Physiotherapists in Animal Therapy) who only allow those who are qualified as human physiotherapists to join. Alex tailors her assessment and treatment to each dog. She has a keen interest in exercise prescription in the canine athlete. She has a particular soft spot for treating nervous dogs (gaining valuable skills from her own dog! ).